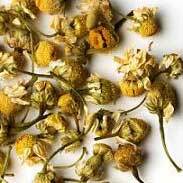 In herbal medicine, it is the dried flowers of Chamomile, an annual, wispy plant that grows all over the world. The name Chamomile comes from Greek where it means ‘Earth apple’. 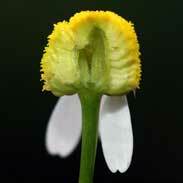 Chamomile’s Latin name comes from the word Mater, meaning both mother and womb. 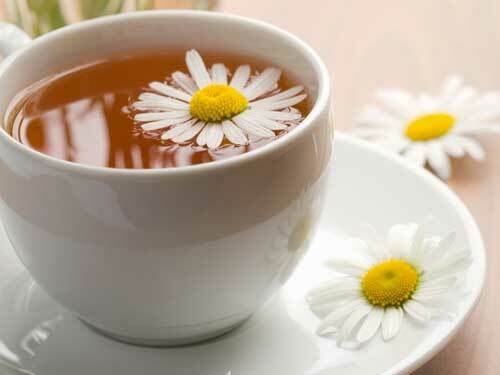 Chamomile is able to relieve intestinal cramping and at the same time induce relaxation. It can be very good for digestive disturbances from infant colic to adult indigestion and everything in between. King's Dispensatory writes 'Chamomile is an important remedy with us, particularly in affections of young children. 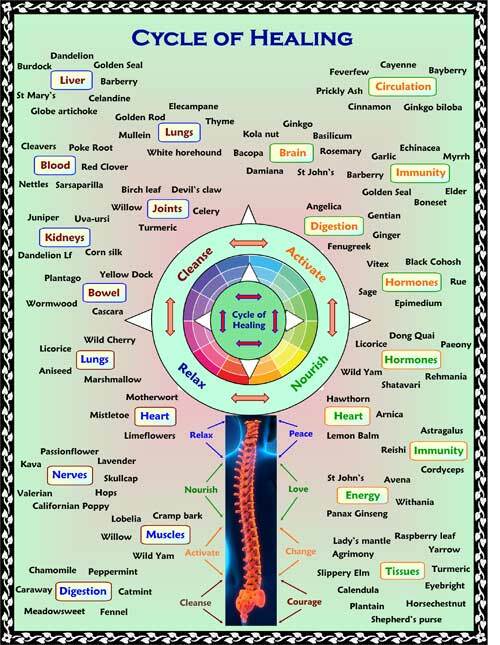 It has two particular specific fields of action—one upon the nervous system, subduing nervous irritability, and the other upon the gastro-intestinal tract, relieving irritation. Various painful conditions are relieved by Chamomile infusion. Among these may be mentioned earache, rheumatism, catarrhal affections of the bowels, ears, nose, and eyes. A Chamomile patient is restless, irritable, discontented, and impatient, and, if a child, is only appeased when continually carried. Inhaling the steam from a strong and hot chamomile infusion is an old treatment for hay fever and skin and eye infections have been treated with chamomile compresses and ‘washes’ by many cultures for many centuries. Strong chamomile teas have been used for both headaches and migraines around the world and Chamomile is considered in European herbal medicine to be one of the most reliable treatments for menstrual cramps. ~ 12 people who were undergoing cardiac catheterization took one strong cup of Chamomile tea just before this catheterization procedure that is infamous for its ability to cause pain and anxiety. 10 of the 12 fell into a deep sleep during the process (Gould L, Reddy RCV, Gomprecht RF: J Vlin Pharmacol 1973;13:475-479). ~ A double-blind study on babies approximately 3 weeks of age with severe colic showed that a tea containing chamomile was significantly better than placebo and a number of the treated babies had a complete resolution of the colic (Weizman Z, Alkrinawi S, Goldfarb D et al. J Pediatrics 1993;122(4):650-652). ~ Chamomile extract in cream form was compared against steroidal and non-steroidal preparations in the treatment of eczema and was found to be as effective as a mild hydrocortisone cream and superior to the nonsteroidal anti-inflammatory agent (5% bufexamac) and a glucocorticoid preparation: 0.75% fluocortin butyl ester (Aertgeerts P, Albring M, Klaschka F et al. Z Hautkr 1985;60(3):270-277). 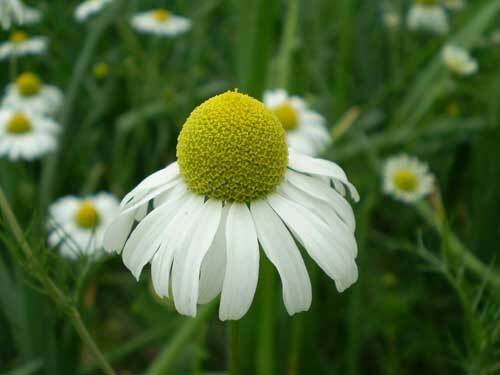 Given how widely Chamomile is consumed in the world there are exceptionally few reports of adverse reactions and Chamomile can be said to be extremely safe for the great majority of people. However, a very few people will find that they have a mild allergy to Chamomile and that getting their skin in contact with the herb will cause itching or a rash or drinking the tea will cause some moderate swelling or discomfort. Chamomile tincture will almost certainly not cause an allergic reaction even in someone who cannot drink the tea as it appears to be the pollen in the plant that are the problem and these do not remain present in the tincture. Being such a common herb, Chamomile is usually rather under-estimated but it is marvellous how quickly Chamomile can give relief when used in the right way. For example, if you give a strong cup of chamomile tea to a person suffering the miseries of indigestion, and make sure that they sip it whilst it is hot so that all the essential oils penetrate into the tight muscles of the gut, you will see how it gives immediate and significant relief. Likewise, bathing an inflamed eye with cooled chamomile tea gives instant relief. 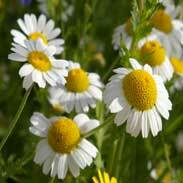 I've had many opportunities to see in person how marvellous a medicine Chamomile can be when needed; e.g. how as little as a tsp of Chamomile tea has successfully relaxed babies whose colic was previously inconsolable, how a cloth soaked in the cooled tea can gave instant relief to the awful pain of an eye infection, how people in all kinds of stress and tension soften up and relax with its soft touch. Chamomile is the great mother herb, the herb we use for our cherished infants with their fevers, their teething, their distress. 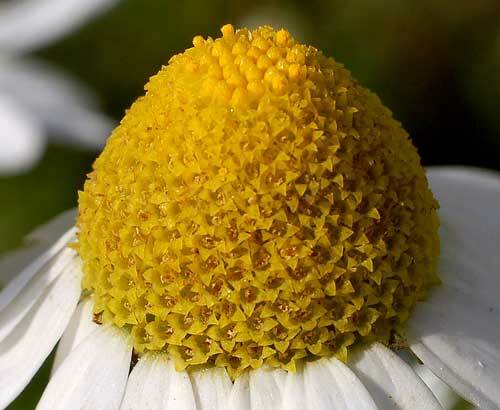 Chamomile is not the medicine that you have to take day after day to build an effect, when you get the form and dose of it right, it will be there when you need it. For anyone who was studying herbal medicine or just wanted to learn more about this great plant ally I warmly recommend the practice of taking a good strong cup of Chamomile tea, or a tsp of its tincture and, with a quiet and open mind, feeling for yourself its unique 'action', how it reaches in to wherever you are most sore or vulnerable and makes things feel better. I don't think it is helpful to be too rigid about doses with Chamomile; it's too personal a matter for how much is agreeable as it is for how much is efffective. For some, a little Chamomile goes a long way, they get the 'action' of it, they relax or unwind, they calm or soften, and giving more would be less than helpful, it might even create some resistance to using it further. Then again, for someone else, subtlelty will be of no value and to really shift a stuck condition, you need to drive it in with the kinds of mega-doses described in the super-strong infusion a little further below. Teas are easy to make in different strengths and even just having more or less of them will juggle the dose up or down. 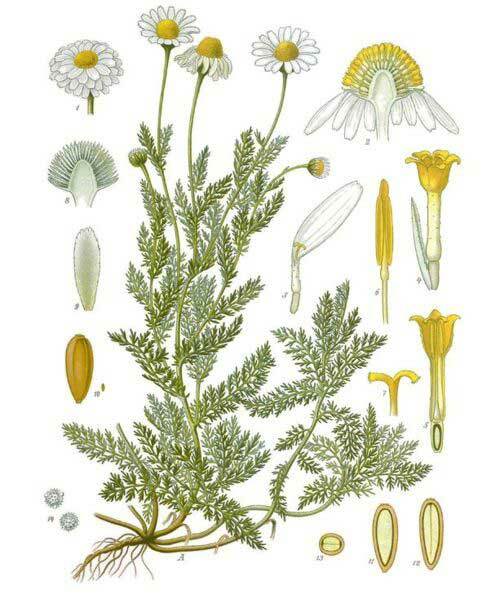 The tincture of Chamomile (which we make as a 1:5 in 40%) is equally amenable to using in smaller or larger quantities. I think that, if a person had at least 1 or 2 mls of it, that they would get its therapeutic action, but that some would need a bigger dose. Children are especially sensitive to Chamomile and might only need 10 to 20 drops to get a strong effect from it. Sometimes you just have to try and see, at least it is entirely safe to experiment with. Chamomile combines perfectly with Fennel for indigestion and sore eyes, with Cramp bark for menstrual pain or locked muscles, with Lemon balm for restless children and with Skullcap for anxiety and insomnia. 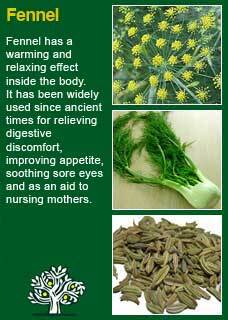 Some methods to prepare Chamomile as a tea and compress are discussed below. To make a good strong Chamomile tea, take (per person) 2-3 heaped tsps (just a little less for a child) of fresh, fragrant, dried Chamomile flowers, pour over about a cup of boiling water then leave the herb to steep for about 10 minutes before straining and drinking. You need more time than normal tea to make a good herbal tea and in the case of a herb like Chamomile you especially need to keep it well covered while it is brewing. Many of the therapeutic essential oils in Chamomile are released into steam by the hot water but so long as the tea is covered the oils will drop back into the water where they can now be absorbed by drinking the tea. Chamomile tea will get somewhat bitter when you make it good and strong like this. That quality of bitterness is not hard to get used to as you might think and you should know that the cause of it is in itself something that conveys healing and soothing to inflamed muscles or digestion. By the same token, you will not interfere with the action of the tea by adding honey and, especially if children are the recipients, I would consider this a fairly necessary step. Honey does blend especially well with chamomile. This is for when your system is in a bad way and you need a potent anti-inflammatory but don’t want to use drugs. 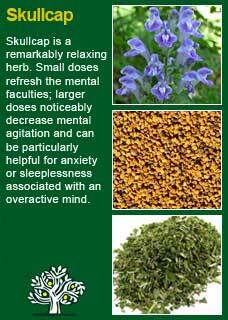 Do not underestimate how much chamomile can help in these cases; it can be remarkably pain relieving, but it is all about the dose, i.e. you have to get enough of it to work. To make a super strong tea you basically take a small handful of the Chamomile (about 8-10 tsps) place them in a jar with a sealable lid, pour over boiling water (about 500-600mls would be ideal) seal and cover with a towel. You then leave the tea until the water has completely cooled down and all the essential oils that turned into steam have been released back into the tea as a liquid. Taking a dose of about 100-200mls (i.e. 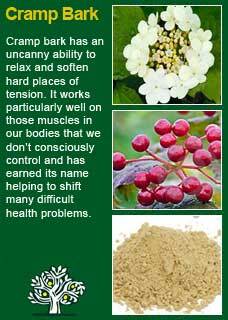 half to one small tea-cup) of this super-strong tea will convey potent anti-inflammatory and healing benefits. The downside is that it will taste extremely bitter and that may be too much for some people to tolerate. You can certainly mix in some honey at the beginning stage when you are adding the hot water if that will make the difference. Likewise, if you prefer you can drink it cool or gently warm it to a more drinkable temperature by adding some hot water to the tea. Tight, inflammatory muscles or other kinds of inflammation in the skin can respond very well to Chamomile when used externally as a compress. Make a tea as above, strong or super-strong depending on how severe the problem is, then make the compress by simply soaking a flannel or some other kind of cloth in the tea after you have strained it off. For a cold compress, put the tea into the refrigerator or add ice to it so that the liquid is very cold. You place the cold, soaked cloth on to the affected area and leave it there until your body heat brings the compress back to normal temperature. If the condition is quite bad, consider having a 2nd cloth on hand to make a 2nd cold compress to apply and cool the condition down even further. A cold compress can be of much help for very hot conditions; the combination of the Chamomile and the physical cold of the compress can draw out much heat and inflammation. For a hot compress, you simply use the tea after it has been freshly made and is still quite hot. 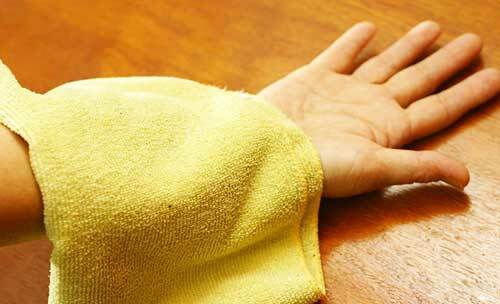 Again you soak a cloth and apply it when it is 'wringing-wet' over the affected area. Then you must cover it with a towel to keep the heat in and, if possible, take it to the next level by putting a heated wheat bag or a hot water bottle on top of the towel. In this method, the Chamomile and the heat combine to get in and provide some deep relief to aches and pains that are of a more chronic nature. When the compress has cooled down to body temperature you are ‘done’ and can take it off or repeat the treatment with a freshly soaked cloth with another dry towel etc. on top of that. In this method, you only use the Chamomile in the hot part of the compress and then simply use cold water from the fridge or that has had ice-cubes added to it for the cold part of the compress. Always start with the hot compress, place it over the affected part of your body until you feel the heat has penetrated well into the joint or muscle and then immediately put the cold compress on that has been soaked to be wringing-wet with water from the fridge or water that has had ice-cubes added to it. The cold compress needs to be kept on until you can feel the chill penetrating into your sore part at which point go straight back to using the hot compress or at least putting a hot heat-source where you had just been making things cold. Generally, it is best to finish with the heat, but it is not compulsory and you should do what feels best. This method can be especially helpful for badly stuck inflammatory conditions deep in the joints, where we need to accelerate the circulation of waste products out of the tissues. Much of the information here about the traditional uses of Chamomile is consistent with the model of thinking whereby one may treat problem A with plant B. There is value in this approach, especially in how it helps us pass on useful knowledge to one another, but it falls short in one vital area; and that is that people are not all cut from the same cloth! Something that works brilliantly for one person may do less for another -- why is this?